AVPro Edge has a wide range of HDMI & HDBaseT Matrix Switchers. It's a given, A/V integrators need to use a switch of some kind to mange an verity of sources and displays. AVPro Edge specializes in 18Gbps signals with HDR, and our matrixes are no different. Below is your guide to the different options out there. We will break down lengths, features and anything else you need to know. If you want to know more about a certain sw just click on the picture or link posted. 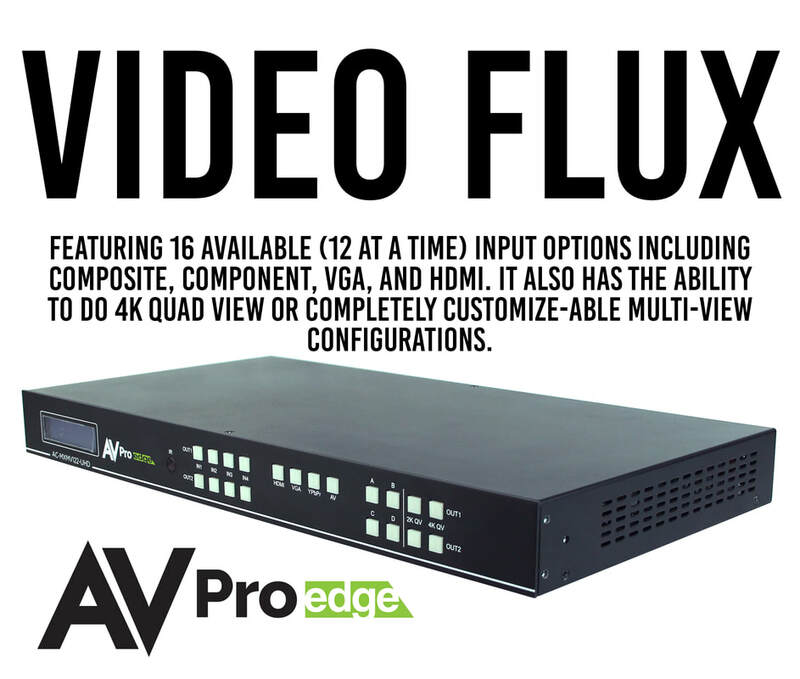 The VideoFlux is an advanced HD/UHD multi-format Matrix Viewer, designed for handling and control of multiple video signals to be displayed in full-screen, dual-view, tri-view and quad-view on a HD or 4K UHD display. Most common analogue, digital video and audio inputs are supported as signal sources including AV (composite video), YPbPr (component), VGA and HDMI. 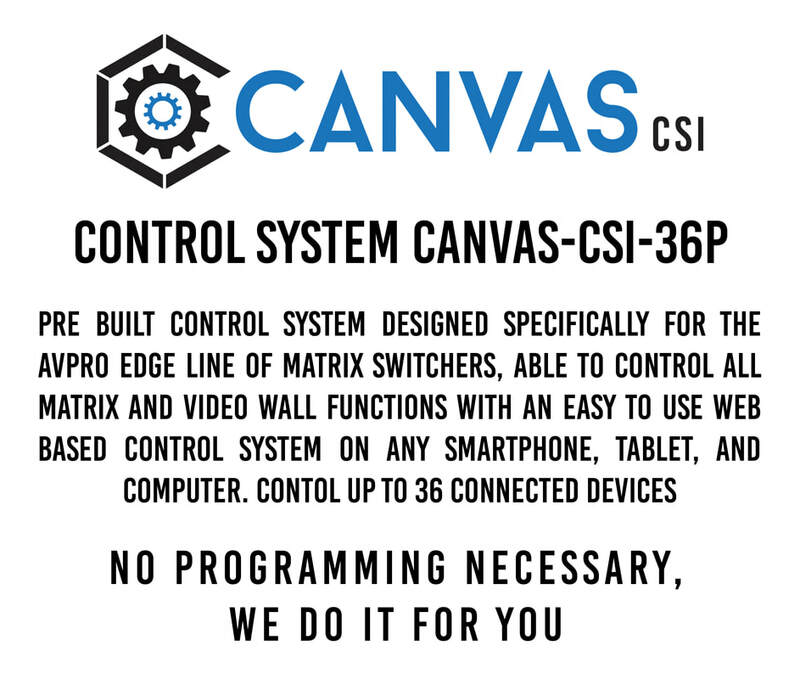 A robust multi-format matrix switch designed for small offices, classrooms, and conference rooms with input types including HDMI (x3), VGA, and DisplayPort. In addition to the local inputs, the Easy Street has an HDBaseT input that is compatible with the ACEX100WPP-UHD so that a wallplate transmitter can be used from anywhere in the room. Two outputs include one HDBaseT (CAT6A) and one HDMI. As a matrix, you have the ability to have different sources displayed on two displays at once. Automatic control makes this the ideal “leave in the room” matrix. A stable alternative to AV over IP. 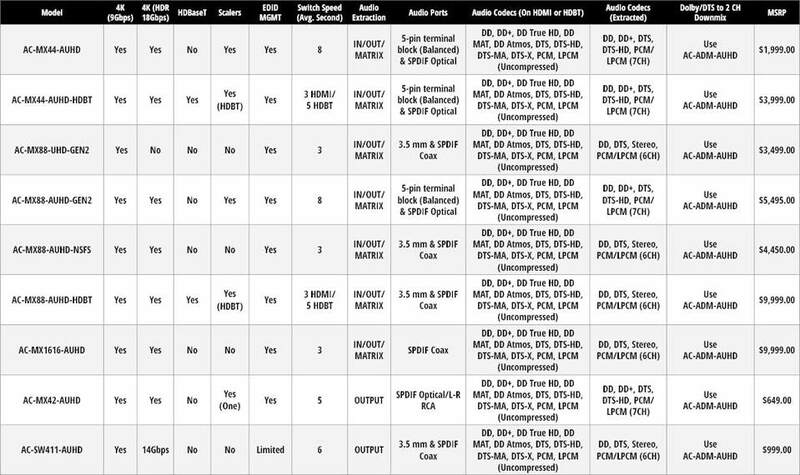 This 9x9 HDBaseT Matrix and Multi-Viewer was made for cascading to allow limitless outputs by adding additional units. The Cloud 9 will give actual lossless images on screen, making it ideal for low to no maintenance setups. 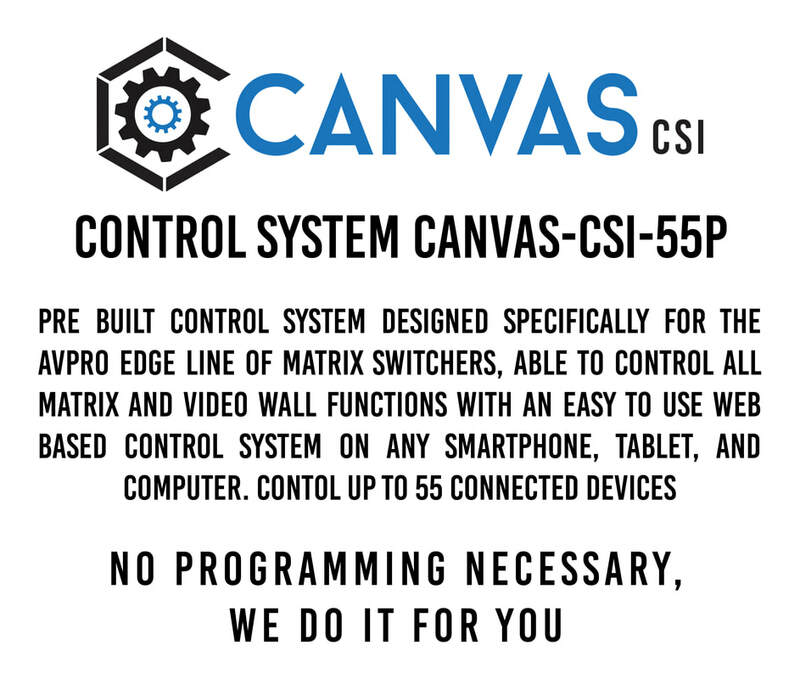 This is a quick and efficient installation option for larger AV systems because no network switch is required. In addition, you will have access to dual, front panel, color screens to further simplify the setup process. 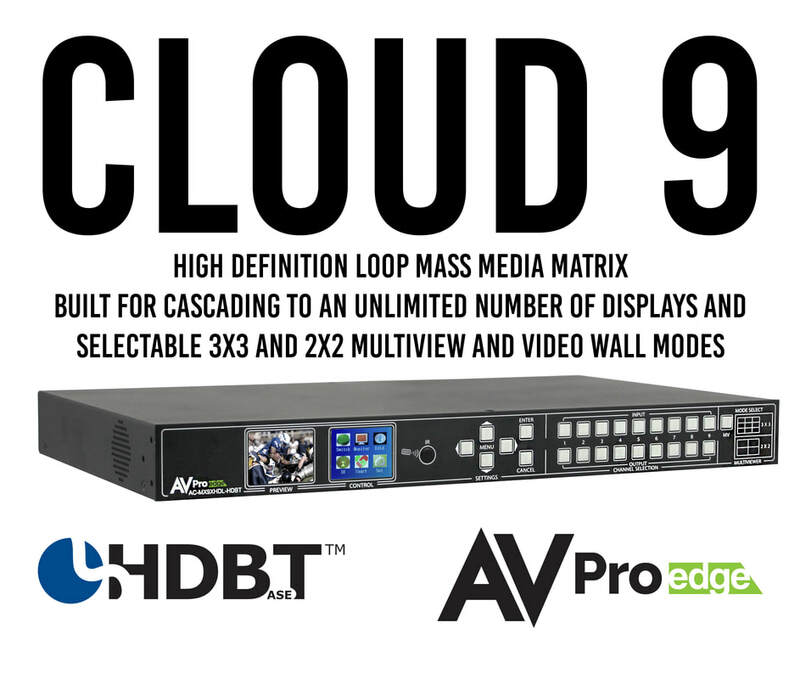 Features of the Cloud 9 include matrixable quad-view, 9-source multi-view, Actual Instant Matrix Switching (AIMS), IR & RS-232 control of the displays, matrixable audio and more. Supporting HDMI 2.0(a/b), HDCP 2.2, up to 4K video resolution, and up to 18 Gbps bandwidth. This switch allows any source to be shown on any of the connected displays. The AC-MX42-AUHD is also ideal for bypassing AVR's that do not support full 18Gbps. You can bypass uncompressed HDMI to the display while running down-scaled video into a legacy AVR. Only video is reduced and audio remains untouched, making it an ideal component for systems where high bit rate audio is critical. 4x4 matrix switch features Toslink audio output support up to Dolby® 7.1, DTS® & LPCM, built in scalers, and on-board audio delay control. This switch has 4 HDMI inputs, and 4 HDMI outputs, allowing 18Gbps HDR signals to be shown on any of the connected displays. Fully matrix-able audio allows you to move the audio signal independently from the video signal at any of the de-embedded audio outputs. Audio delay is also ‘on-board’ so you can manage lip-sync issues before they become a problem. Also, with built-in scalers you don’t have to forfeit that 4K signal just because you have a few older displays. 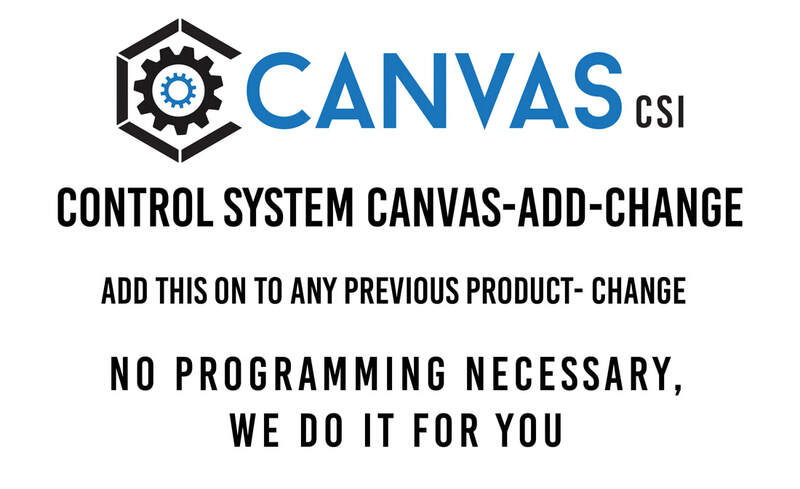 Additional features include ip control, EDID management, military grade stability, LCD Display, and more. This 4x4 matrix switch has four inputs and four mirrored output blocks, each output block contains both a HDMI and HDBaseT port capable of handling full 18Gbps video signals with HDR metadata. It is able to do this on the HDBaseT outputs by using AVPro Edge’s ICT technology. Along with this switches high bandwidth distribution, it’s features include IR and RS-232 control, EDID management, scaling, audio matrix, audio delay and more. 8x8 matrix switch features Toslink audio output support up to Dolby® 7.1, DTS® & LPCM, built in scalers, and on-board audio delay control. This switch has 8 HDMI inputs, and 8 HDMI outputs, allowing 18Gbps HDR signals to be shown on any of the connected displays. Fully matrix-able audio allows you to move the audio signal independently from the video signal at any of the de-embedded audio outputs. Audio delay is also ‘on-board’ so you can manage lip-sync issues before they become a problem. Also, with built-in scalers you don’t have to forfeit that 4K signal just because you have a few older displays. 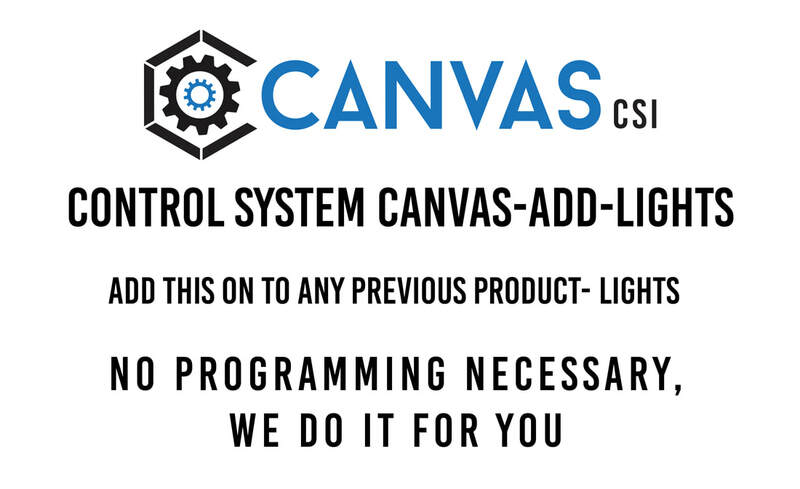 Additional features include ip control, EDID management, military grade stability, LCD Display, and more. This 8x8 matrix switch has eight inputs and eight HDMI ports capable of handling full 18Gbps video signals with HDR metadata. It is able to do this on the HDBaseT outputs by using AVPro Edge’s ICT technology. Along with this switches high bandwidth distribution, it’s features include IR and RS-232 control, EDID management, scaling, audio matrix, audio delay and more. Eight HDMI inputs, with eight mirrored HDMI/HDBaseT Outputs. 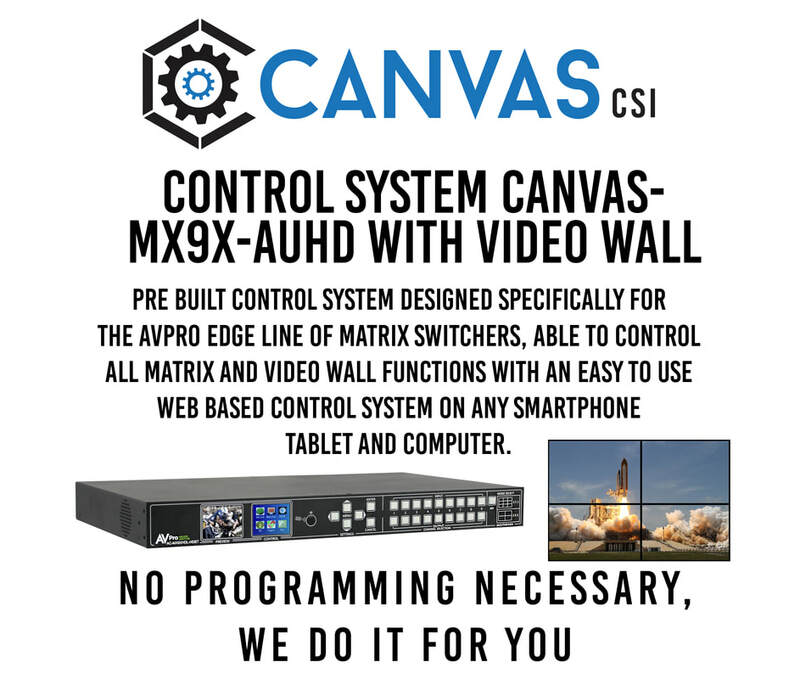 This 8x8 matrix switch has eight inputs and eight mirrored output blocks, each output block contains both a HDMI and HDBaseT port capable of handling full 18Gbps video signals with HDR metadata. It is able to do this on the HDBaseT outputs by using AVPro Edge’s ICT technology. Along with this switches high bandwidth distribution, it’s features include IR and RS-232 control, EDID management, scaling, audio matrix, audio delay and more. An ultra low profile 16x16 matrix switch with 16 HDMI inputs, 16 HDMI outputs, and 16 fully matrixable de-embedded audio outputs built for quickly switching uncompressed HDR and 18Gbps video signals. 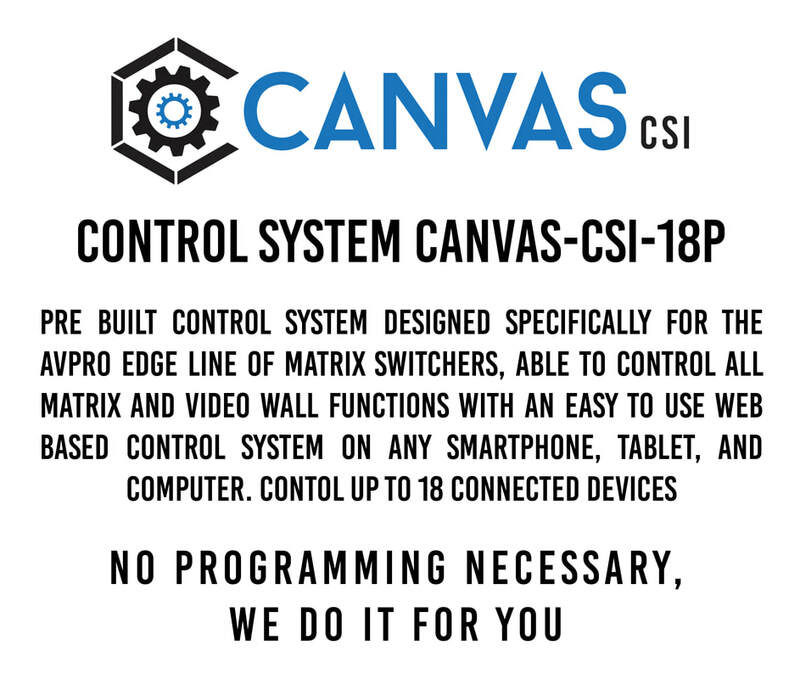 This unit has 16 HDMI inputs and 16 HDMI outputs, each output is fully matrix-able, allowing the user to switch between any of the inputs to any of the outputs. On top of that this matrix comes with 16 de-embedded audio outputs that are fully matrix-able separately from the video signal. Additionally, this unit supports uncompressed HDR formats, including HDR, HDR10, HDR10+, Dolby Vision, HLG, BBC and NHK (all in 4K 60Hz and up to 12-Bit Deep Color). All color space compression is compatible as well. 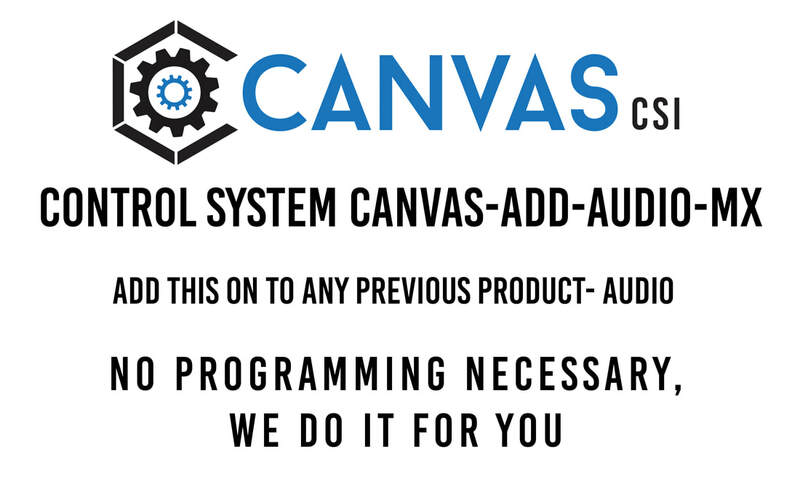 ​AVPro Edge brings you a complete Professional A/V Control System that is an out of the box, turn key solution and fully customizable. 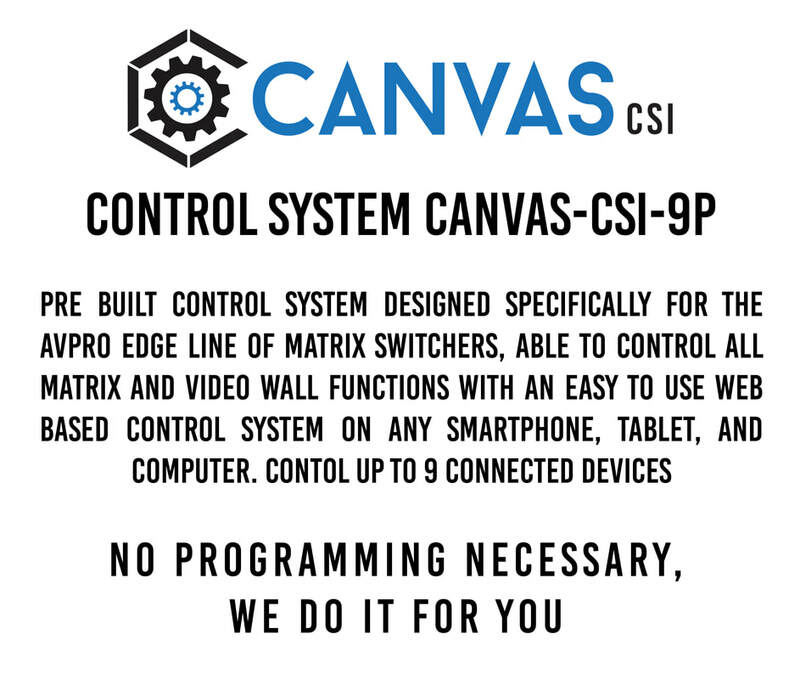 This is how it works; install any number of Cloud 9 switches into your system. You will have a consultation with one of our Control Specialists to find out exactly what your video and audio distribution is going to be like. We will then do everything else for you and program a complete control system. You can then access the control by using an app on any iPad, NO CONTROL HARDWARE NECESSARY. That iPad becomes your complete remote control, and all you had to do was answer a few questions about your sources and displays. Also with added support like year long support for an additional $300.00, you won't have to worry if something needs to be renamed, changed or moved through out the year. 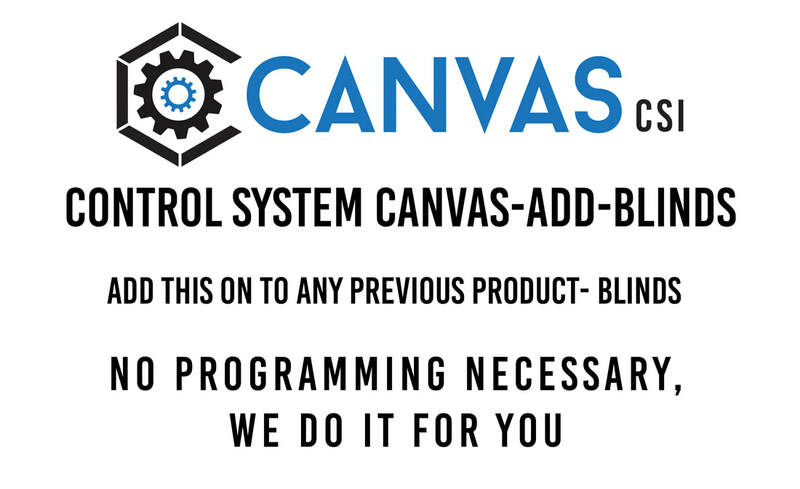 ​Canvas CSI's control systems can be whatever you need them to be, that is evident by our add on features that you can add to any core CanvasCSI control system.